This two-day training experience is your opportunity to get back on the water and practice your boat handling and sailing skills. On the Water Training (OWT) gives new sailors experience steering the boat and performing each role during anchoring, reefing, rescuing, and sailing. Experienced sailors have the opportunity to take command through practice maneuvers and brush up on less-used skills. This year's OWT will include exercises in line handling and steering while leaving and approaching docks, slips, and moorings. We'll practice rafting and separating as well as anchoring techniques. 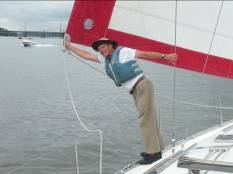 We'll review effective communication -- both on board and over VHF -- and practice sailing skills including sail trim, tacking, and jibing. Friday June 1, 9 p.m. - Post supper discussion of the effects of wind, current, and prop walk while maneuvering. 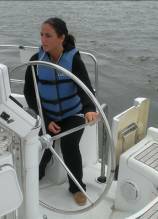 Saturday June 2, 8:00 a.m. to 4:00 p.m. - Boat systems overview, communication, essential knots. Under power exercises. Under sail exercises. Lunch on the water. Dinner ashore. Sunday June 3, 8:30 a.m. to 3:00 p.m. - Under sail - sail trim, man overboard, heave to. Anchoring and rafting drills. Lunch on the water. Unlike most of our trips, this course is not preceded by a pre-trip meeting. The boats return to their slips each night, and dinners are ashore. Everyone is responsible for supplying their own breakfasts and lunches. Coordination among crews is encouraged, once boat assignments have been made. The cost of this event is $285.00 per person. This price covers only charter fees. Food, fuel, and other incidental expenses are additional and will be handled by each boat's crew. Reservations are on a first-come, first-served basis. The FULL AMOUNT and Release of Liability and Zero Tolerance Form must accompany your reservation form. Please make your check payable to The Sailing Club, Inc. and mail it, along with your completed reservation and release forms, to Mia McCroskey at the address below. The Club's standard 30-daycancellation policy applies for this event.